Studies have show that unplugging from the digital world can be beneficial to your health by reducing stress, improving creativity on your return to “the real world”, and even improving heart health. However, even on vacation, it’s becoming more and more difficult to leave our gadgets and work behind. But we’ve found some resorts set in stunning natural surroundings that will get you off the grid and help you achieve the ultimate relaxed state. Depending on where you are in the world, it takes anywhere from 10 hours to 2 days of travel to reach Maldives. Once there, disconnecting and preparing to relax is the easiest part. The Coco Bodu Hithi is a tranquil resort with a full-service spa and plentiful recreation options if lounging in the sun by the crystal blue water proves to be too monotonous. Traditional island architecture and design forms the base for elegant and contemporary amenities, and warmly welcomes you to the paradise of the Maldives. Explore this fairy-tale like property and escape from the hustle and bustle of city life at the oldest wine estate in South Africa’s Drakenstein Valley, in the heart of the Franschhoek and Boschendal Winelands. Located an hour’s drive from Cape Town, these luxurious accommodations are located on the grounds at Boschendal which has been a working farm since 1685. While your creature comforts are well taken care of in these well-appointed cottages, feel welcome to explore the grounds and surrounding mountains on foot or on bike and leave your inbox behind. In the heart of the Adirondack Park on Lake Placid, this six-million-acre recreation area in upstate New York has drawn nature lovers for decades. Though the lodge gives off a distinctly 19th century vibe by design, the amenities are fully 21st century. If you can imagine an outdoor activity, you can most likely find it in the park. From skiing (both cross-country and downhill) and dog sledding in the winter to fishing and mountain biking in the summer, there is truly something for everyone. If your idea of relaxation does not include outdoor exertions, there is also a full-service spa on property as well as an indoor heated pool. A remote island off the eastern coast of Africa, Seychelles is continuously at the top of any “best beaches in the world” list. The atmosphere is romantic, exotic, lush, and refreshing – perfect for relaxation as you breathe in the sea-spiked air of this ever beautiful island. At Banyan Tree Seychelles you are on the remote southwestern coast of the island, a 45 minute drive from the capital of Mahé. Unwind at one of the oceanfront villas, complete with private infinity pool, or spend an unforgettable day at the spa for the ultimate pampering experience. Sedona is famous for its deep canyons, red rocks, and endless trails for hiking and biking. If remote relaxation is what you’re after there is an on-site spa at the hotel, and the reception team will gladly assist in a Jeep or helicopter tour of the surrounding rocks. Completely devoid of kitschy clichés, interiors of this intimate boutique hotel pick up on the modern aspects of Southwestern design, meshing it with traditional Moorish flair. Located on a secluded section of Langosta Beach, the sunsets are vibrantly visible and the tide rolls in over volcanic rock at this Costa Rican treasure. There is no shortage of activities to chose from at this beachfront hideaway, with everything from horseback riding to deep sea fishing at your disposal. The hotel is also home to a troop of howler monkeys that live in the beachy jungle just outside your door, providing some very much unplugged entertainment. At this luxurious 5-star retreat, you are surrounded by the majesty of a 10 million year old rainforest contrasted by the sparkling Andaman Sea visible from your private villa. Although only 15 minutes away from Langkawi’s airport, once on property you are transported to an oasis high amongst the trees. The on-site spa, perched above the ocean, provides traditional Malaysian healing rituals alongside more contemporary facials and massages. If that isn’t enough, there is also an adults-only infinity pool looking over the ocean that is sure to make checking your e-mails the bottom of your priority list. This member of the exclusive National Geographic Unique Lodges of the World is truly off the grid, accessible only by boat from the nearby Granada Marina. A little piece of paradise, this is one of the world’s most renowned eco-retreats, where romantic interludes, spiritual epiphanies, and unforgettable interactions with nature happen. Each of the 9 sustainably built luxury casitas is suspended above the ground to avoid disturbing the natural formation of the island and built with Rainforest Alliance certified wood so you can sleep easy knowing they are well-deserving of their ecolodge status. With no TVs or phones in the casitas, it make disconnecting the easiest part of your day. Starting out as a private summer retreat for a group of friends, Latitude 10 is now an ecoresort of just 6 rooms. Casitas built smartly into the Costa Rican jungle without cutting a single tree and cobblestoned paths connect the bungalows, where a cool breeze flows through unhindered. From the open-air outdoor showers to the lanterns lit each night by the hotel staff, this romantic resort also offers surf lessons, complimentary yoga, and the opportunity to leave your worries at home for a truly rejuvenating experience. Designed in a classic Southern style, these accommodations offer luxurious residential touches such as vaulted ceilings, fireplaces, opulent bathrooms, and verandas with stunning views. Halfway between Savannah, Georgia and Hilton Head Island, the resort offers everything you could could possibly need or want right on site. From a Jack Nicklaus golf course to an almost limitless spa menu, this resort makes relaxation foolproof. 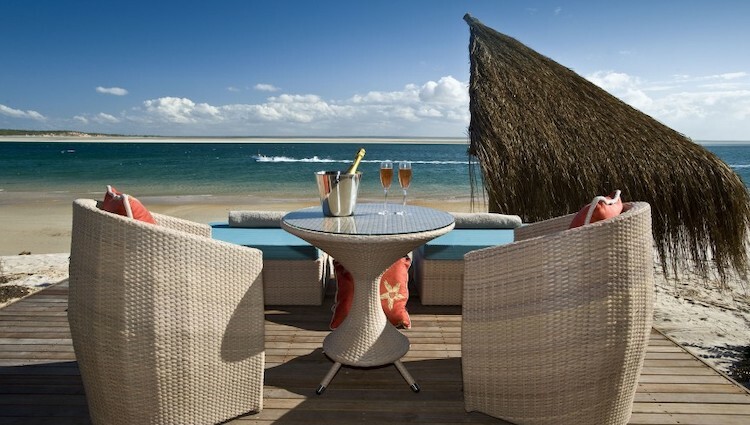 Poised on the East African seaboard on the dazzling Indian Ocean shores of Mozambique, this remote refuge resides within the Vilanculos Coastal Wildlife Sanctuary. You will never feel overcrowded, with only 14 luxuriously appointed, air-conditioned chalets with direct access to the beach via individual pathways as well as a private deck furnished with day beds for relaxation with panoramic ocean views available for booking at any time. Due to its location within a wildlife reserve, the lodge is powered with a combination of solar and generator power while still providing an unforgettable luxury experience.